Other than that, I've been looking forward to my upcoming week of travel. Marian and I are going to travel together again and we plan to start off in Puebla, about 7 hours south of here by bus. We will be leaving right after classes next Friday and just go with the flow. I know that I'd like to see Puebla, Veracruz, Acapulco, and Oaxaca City and it's just a matter of finding the time to fit in these cities in our short time. 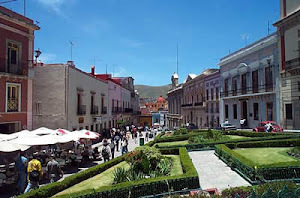 I will have to be back in León-Guanajuato by the 2nd of February so that I can fly back to the states on the 3rd. I still can't believe how fast time has gone by already and I am savoring every last bit of time I have left here. I'm not sure what I am going to be doing once I return to the states, but my friend Becki says that I "fly by the seat of [my] pants." Good 'ol spontaneity...that's how I roll. That's pretty much all I have for now. I love that quote, btw! It really does describe how I feel about life as well. Hahah...and on a random note, Queretaro reminds me of this really cheesy video series called "La Catrina" that my spanish teachers used to force us to watch in class during high school. The main character was a hispanic girl from LA who spends a summer with her relatives in Queretaro. =p Ah, memories! Mmm...since i'm writing here already, i'm also gonna comment on your more recent post. I think it's incredible that you got to learn about this program! I imagine it'll be really similar to what you'll be doing for the peace corps? It looks soo exciting, yet SOO intimidating!! And yet I know it's the kind of thing that you'll really love to immerse yourself in =) You're really gonna make a difference!